The Moon is in Capricorn until 7:21 PM. The Moon is void from 4:35 PM to 7:21 PM. The Moon is in Aquarius from 7:21 PM forward (until Monday, May 11th, at 10:53 PM). The Moon is waning, and is in its Waning Gibbous phase/ Disseminating phase. Mercury is in its shadow phase, pre-retrograde. (Mercury will be retrograde from May 18 to June 11). As an Aries, you are especially annoyed by beating around the bush, but today, you could be meeting a lot of this kind of energy. It can be difficult to get to any real conclusion, to follow directions, or to thoroughly understand what’s going on around you. However, if you’re able to pull yourself away from facts and figures and the world of logic, this can be a good day for dreaming, imagining, and enjoying the world of creativity or imagination. Later today, there could be a missed connection or off timing in your relationships. While you’ve been clearer and more objective about your financial state, talents, and resources these days, Taurus, today, facts can be unclear. Wishful or fearful thinking can skew your perceptions. For this reason, it’s better to wait for a clearer time to make important practical decisions. There might also be a confusing situation surrounding a friend or with networking. When boundaries are hard to define, be a little more cautious and vigilant today. Later, there can be a feeling that you’re not getting the whole story from someone as well, or you could be faced with someone’s cool responses. Timing is a little off now. Even so, there is good energy later today for talking things through and bonding with a partner. The desire to escape all pressures today can be strong, Gemini, but a luxury you may not be able to afford at the moment. Look for ways to better balance your life or to find a compromise. There can be confusing situations on the job or with an authority figure, and interactions can be tricky if you end up projecting your fantasies onto people or situations. Try not to make more out of a circumstance, or a person, than they truly deserve, whether you are skewing things positively or negatively. Later today, the urge to splurge is strong, but you could be getting some disapproval from a partner or friend. It can be difficult to truly know whether you want to get close to someone or if you want to have some space. With Mercury in your privacy zone in difficult aspect with Neptune today, Cancer, try not to share a secret, whether it’s yours or someone else’s, as it may not stop there. It can be a good time to dream and imagine, but not the most productive of energies for practical matters or straightforward answers and conversations. Venus is in your sign, and these brings out your more attractive qualities in general. However, later today, Venus forms an awkward angle to Saturn, and you may sense some resistance. This can be due to your own insecurities or worries about your responsibilities, or it could be coming from a disapproving person in your life. You may be feeling restless with your routine, and bothered by elements of your daily life that are not working very smoothly. Part of you wants to enjoy yourself and indulge, while another part wants to put things in order. Instead of turning this into an either-or situation, try to manage doing both in smaller ways. There may be a mild disappointment, confusion, or discontent when it comes to your social or romantic life, Leo. Some of you might even experience a vague feeling of being manipulated or blackmailed emotionally. Resist being drawn into or engaging in this behavior. You are finding beauty as well as pleasure and enjoyment in hidden or less obvious places these days with Venus in your solar twelfth house. You readily give of yourself on the level of support, help, and service, but you keep a bit of a distance emotionally. However, later today, there could be a feeling of imbalance and some indecision with Venus and Saturn in an awkward angle. Something could be holding you back from expressing yourself, or there may be some off timing to deal with. There can be more sensitivity than usual to imbalances and unfairness in your life today, Virgo. There could be a feeling that you are in the dark about an emotional matter, or that you are somehow being duped or overlooked. Relations with a partner or significant friend can be slightly off or hard to figure out. Someone could be omitting something important, or keeping something from you. Try not to get pulled into emotional games. Be more vigilant when it comes to putting your faith into someone or something. Avoid falling for people’s bluffs. When it comes to bosses, parents, or other people in authority, communications can be off. Alternatively, you could be questioning or escaping some of your duties and goals. Treat doubts as red flags only if they persist for some time, as they may simply have to do with insecurities. The desire to experience something more than the ordinary can come over you today, Libra, but it can also play with your perceptions a little if you’re not careful or aware of it. Honor your need to learn and know more, but be extra vigilant if life’s circumstances keep you in situations where you need to pay special attention to details. You could be having a hard time deciding whether to say something straightforwardly or fall back on what you think people want to hear. If you’re wavering about an important decision, consider that you truly need more time with it and give yourself that time. There is misleading information and speculation floating around you, and the tendency to forget or overlook things runs high. Make time and space, if you can, for creative or relaxing activities. 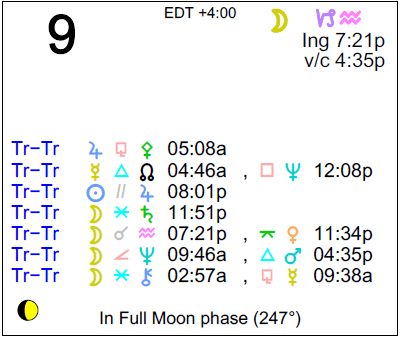 There can be restlessness today, Scorpio, but also a lack of energy to do anything to tame or handle it. Relationships and feelings can be confusing today. Imagination or wishful thinking can lead to skewed perceptions of a situation, but if you channel this is in the right direction, there can be some wonderful creativity now. Later today, you may be feeling a financial pinch. There could be some wavering about going forward with a relationship or financial matter, and perhaps it’s a sign to wait. Overall, the day does not favor seeing people and things clearly. This can be a fine time for dreaming up where you might want to go with your life, Sagittarius, but not so hot for getting solid answers from others. You are unlikely to be seeing people clearly in general just for now. There may be deception or self-deception to deal with today. Rhythms in relationships, feelings, and love, can also be rather off or awkward. You may very well be second-guessing things, but it’s best not to push for answers. You may be at peace with others and at war with yourself if you choose to make compromises that don’t feel entirely “right”. Save important decisions and discussions for clearer times. You may want to second-guess what you hear or perceive today with logical Mercury in difficult aspect to dreamy Neptune, Capricorn. There may be outright deceptions, but don’t rule out self-deception or misunderstandings, which can also hide the truth. When it comes to health and work matters especially, you may want to wait to make important decisions. Do allow yourself to think in creative, imaginative, dreamy ways, as these things are favored, but acting on them now may not be wise. Later today, you could be dealing with errors or discrepancies from the past that hold you back from enjoying the present. This can be a strong day for paying attention to, or learning more about improving, your health and wellness. Enhancing well-being is favored now. You might also enjoy supporting and helping your loved ones today. However, our perceptions may be a little off today, possibly skewed by wishful thinking. People may be skirting or overlooking the truth. There might also be a feeling that you are missing something or failing to meet a responsibility. Go over all of your duties and if you are up to date, then give yourself permission to enjoy yourself! There could be some confusing social or work situations that require waiting things out before clarity comes. Interactions today can be on the confusing side, or possibly simply open-ended, Pisces, with logical Mercury in difficult aspect with your ruler, elusive and dreamy Neptune. Someone could be pushing for an answer but you’re not ready to make that kind of definition or commitment. Watch for deception. Later today, there is a stronger need for pleasure and affection, but you may not be able to fully relax as the demands of others or the outside world can weigh heavily on you. Work on finding a balance so that you’re able to relax. 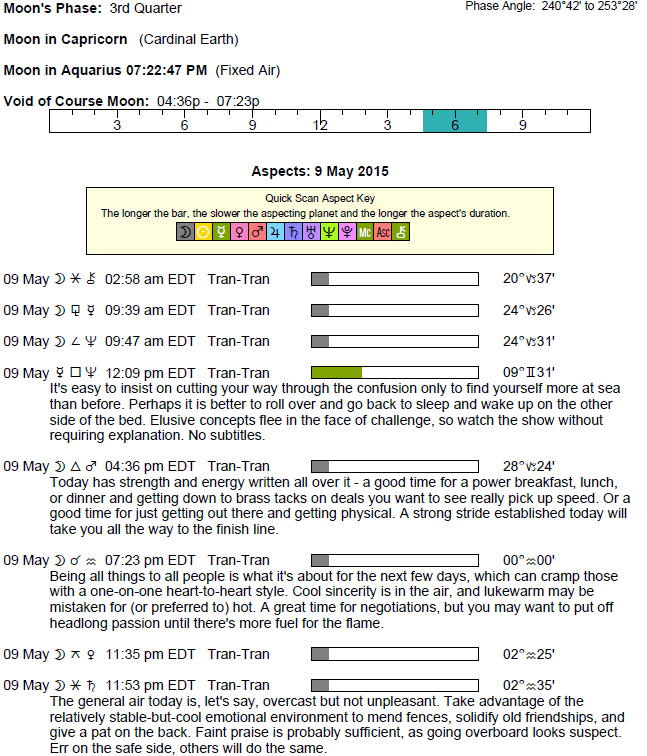 If Your Birthday is May 9th, If Today is Your Birthday full horoscope here. You have the opportunity to use your sensitivity in the field of arts or spirituality. You are an intensely emotional person, prone to extreme highs and lows. You love drama and intensity. This can create problems if not channelled into a creative outlet. Cnj 14°Cn17 SIRIUS*** The mundane becoming sacred.